I gave you a short description of the content of each of these two tests in the previous section, but it probably wasn’t enough information for you to make a decision. This choice ultimately comes down to whether you’re more comfortable with the macro or micro aspects of biology. SAT Biology-E deals more with large-scale energy flow in ecosystems and changes in the environment over time. By contrast, Biology M focuses more on the chemical elements of biology that occur on a miniscule scale. If you’re more of a science-oriented student, you’ll probably be better off with Biology-M. If you’re more into subjects like history and English, Biology-E might be a better choice. Keep in mind that the two tests aren’t completely different. There are only 20 questions out of 80 that are specific to either E or M. For this reason, I wouldn’t stress too much over your choice. If you took a biology class and did reasonably well in it, you shouldn’t have a problem with either version of the test. Oh, and for anyone who’s wondering—yes, you can take both Biology-E and Biology-M, but you can’t take them both on the same test date (makes sense, considering they’re almost the same test!). Biology-M is more about this type of stuff. You know—all the creepy things happening at the molecular level inside your body. 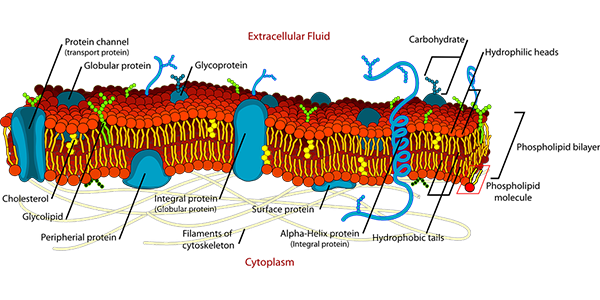 What’s on the Biology SAT II? From the chart, you can see that many more questions are devoted to Cellular and Molecular Biology on the Biology-M test, and many more are devoted to Ecology on the Biology-E test. 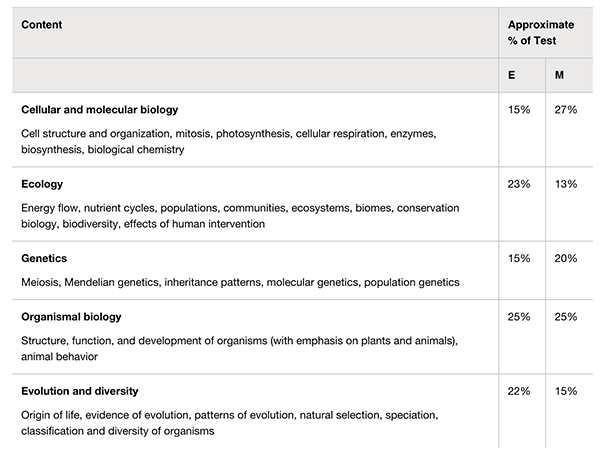 Notice that Biology M also has slightly more questions on Genetics, whereas Biology E has slightly more questions on Evolution and Diversity. Both tests have the same number of questions dealing with Organismal Biology. These topics should all be familiar to you if you’ve taken a biology course. Essentially, 70% of questions will present a scenario and then ask you to make deductions or calculations based on it. The scenario could be a chart of bacteria growth or a description of a lab procedure. It’s important to know the fundamental parts of an experiment (independent and dependent variables) and be able to project your understanding onto unfamiliar situations. The other 30% of questions just ask you to recall biological facts directly. I’ll provide examples of different types of questions you can expect to see on the test in the next section.